Ballinacurra House - a "Private Estate for Exclusive Hire" close to Ireland's gourmet capital, Kinsale, County Cork. In these frenetic times, "Privacy is a Priceless Commodity"
But set within a walled garden with 10 foot-high stone walls, security gates and 40 acres of woodland and lawns, this elegant country mansion brings back old-world opulence and personal service in a unique and totally private environment. Our exclusive-use estate allows you the opportunity to share your experiences or special occasion with friends, family or peers in magical ambient surrounds, without compromise. Although we can offer all of the luxuries you would expect in any five-star setting, we do not have the downsides of a hotel or guesthouse - sharing with people you do not know. You take the entire property, and we work with you to understand what you wish to achieve -- be it total relaxation, golf, holiday, family reunion, corporate meetings, sporting activities, client hosting, celebrations, small weddings, birthdays, corporate team building events, product launches, cocktail parties and many more. We can do all the event planning to implementation or work with your own event organizer. Flexibility is the key - but we will give you the best of local knowledge and international experience to advise you in the right direction to meet your objectives. With the owners' 25 years experience in the event management business, Ballinacurra House is fast becoming known as Ireland's Premier Intimate Events House - with a guarantee of privacy, discretion and style. -The exclusive-use property can accommodate 18 people in individually themed suites, up to 42 people sharing at maximum configuration. -The property consists of The Main House, which has 14 suites, whilst the optional Coach House has an additional 4 rooms. -The House boasts ample communal areas such as bar, snug, dining room, news room, sitting room, living room, commercial and domestic kitchens, golf club drying room, and massage facilities. -The renaissance style Ballroom seats 60 + for stylish sit-down dining or we can serve 80 banquet-style using the whole house. -The beautiful south-facing aspect includes an outdoor entertainment patio, croquet lawn, playground, helipad, picnic lawn, pond, small boat jetty, fishing deck, forest pagoda and woodland walks, which front onto Whitecastle Creek and Ballinacurra Creek (estuaries of the Bandon River). 14 individually designed en-suite bedrooms can accommodate a maximum of 36 people in 6 Doubles (most with King size beds), 2 Twins, 4 Triple rooms and 2 Family Rooms (sleeping 4 people each). All en-suite with both power showers and baths, shaving points, hair dryers, satellite TV, CD players, DVD players, Telephone and Modem (ISDN) points. The optional Coach house has an additional 4 bedrooms (4 doubles) with a shared kitchen. The rooms have all the same inclusions as the Main House bedrooms. 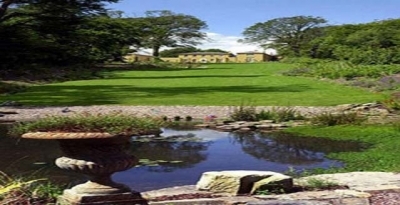 The Coach house is situated approximately 50 yards from the Main House.